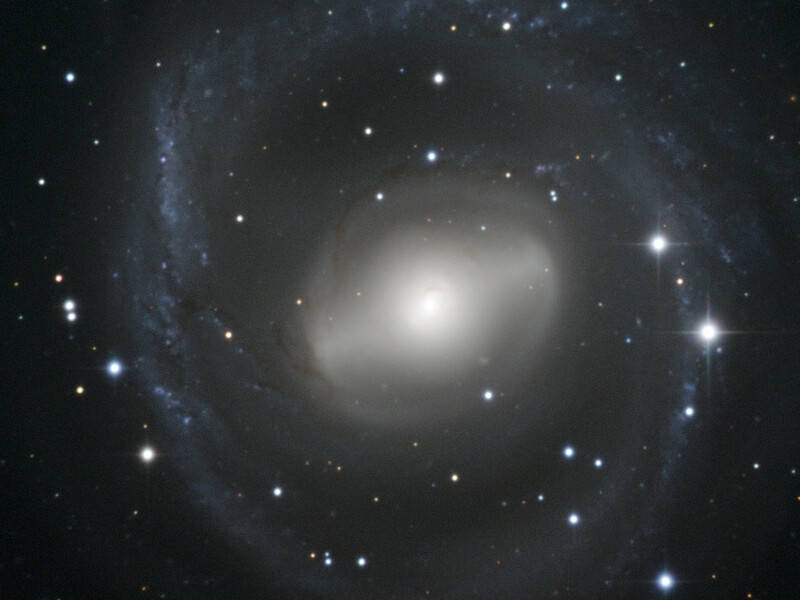 This image shows the swirling shape of galaxy NGC 2217, in the constellation of Canis Major (The Great Dog). In the central region of the galaxy is a distinctive bar of stars within an oval ring. Further out, a set of tightly wound spiral arms almost form a circular ring around the galaxy. 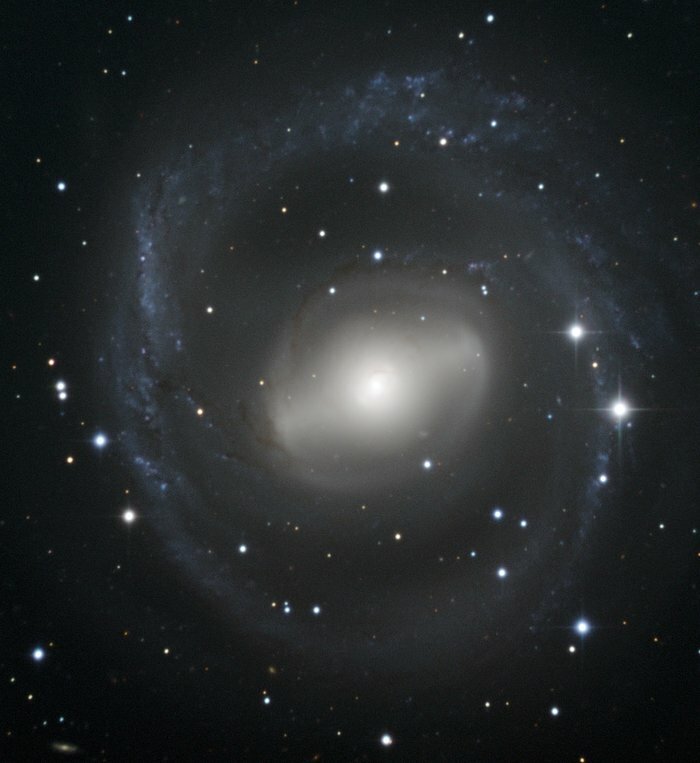 NGC 2217 is therefore classified as a barred spiral galaxy, and its circular appearance indicates that we see it nearly face-on. The outer spiral arms have a bluish colour, indicating the presence of hot, luminous, young stars, born out of clouds of interstellar gas. The central bulge and bar are yellower in appearance, due to the presence of older stars. 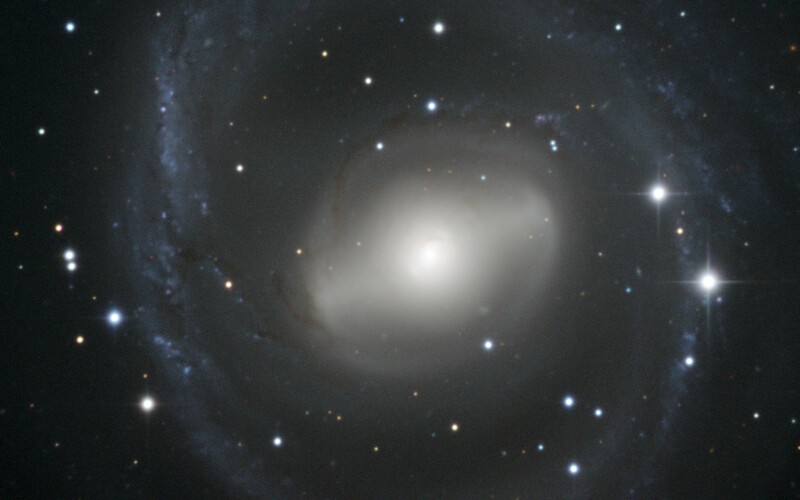 Dark streaks can also be seen in places against the galaxy’s arms and central bulge, where lanes of cosmic dust block out some of the starlight. The majority of spiral galaxies in the local Universe — including our own Milky Way — are thought to have a bar of some kind, and these structures play an important role in the development of a galaxy. They can, for example, funnel gas towards the centre of the galaxy, helping to feed a central black hole, or to form new stars. Position (Dec): -27° 13' 56.90"